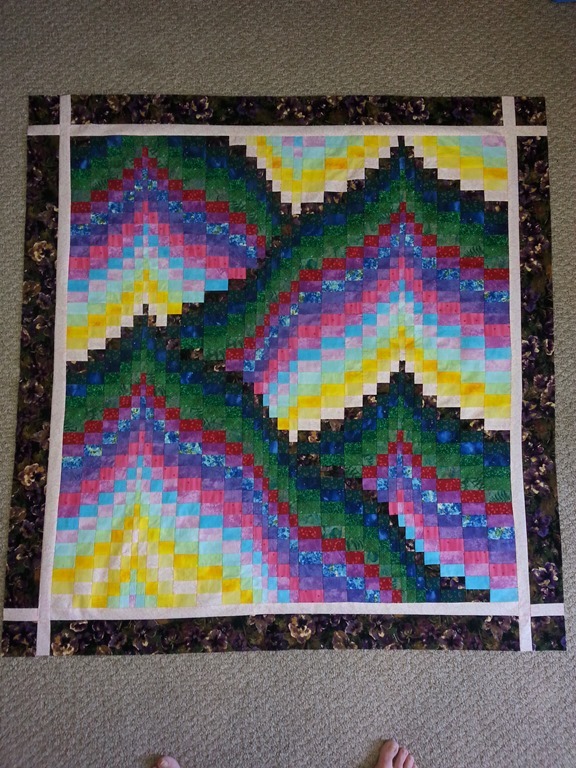 I learned a lot doing this quilt. trust my instinct with colours and values The instructions said to do dark to light values – Looking on this now, I can’t help but think that I might’ve done better doing colours from light to dark and then values within the colour families. I’m thinking that the blues and yellows wouldn’t look like such a hard separation if I had done that. I am glad that I kept the dark red and the blue print – I think it adds character and a dramatic flair. stitch alternate directions when doing the strips. 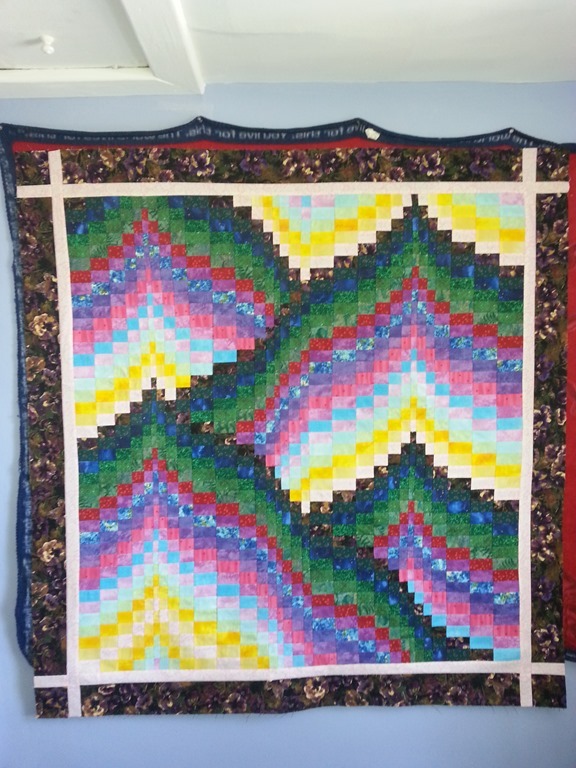 I’m not sure if you can see but this quilt is wonkier than hell. Waves and waves all over the place – it IS square after using the border trick to get it so – it started out an inch out of whack and is now dead on I will work and tweak out the waves with quilting .. lots of quilting LOL I wanted to do mitred corners, but wasn’t sure how to work the border squaring trick with mitred corners. The one thing that I am really glad I did do is make my own spray starch – things went way better after I did that. I ended up diluting the solution more than the website stated – I don’t need it that ‘thick’ Just a bit to keep my fabrics more sturdy and ‘stiff’ to make them easier to work with and more manageable. PURTYFULL!!!! 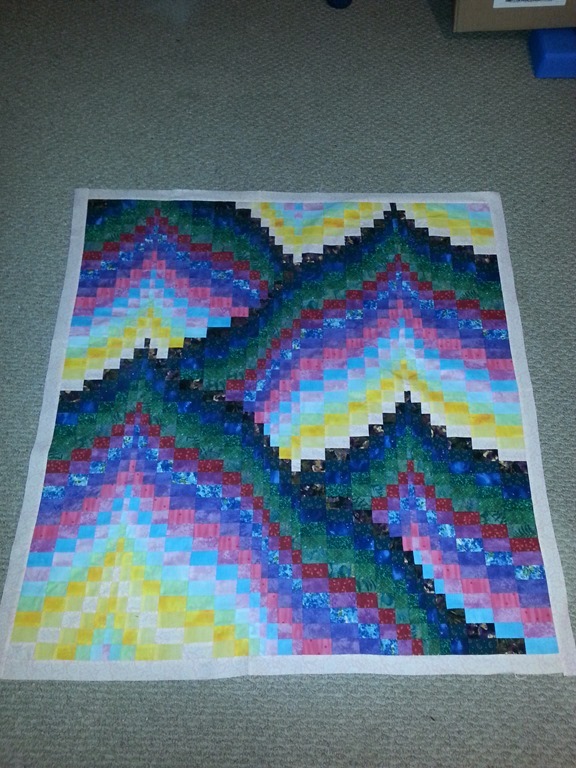 I’ve done bargello BUT as a needlepoint not a quilt. Kudos to you Grace!